It’s always tough to work with creatures of myth that are not from your native culture. You find yourself wondering, what do the people of the country of origin think of this? Alternatively, am I even getting the right information? This is the predicament I find myself in when discussing the Bungisngis. 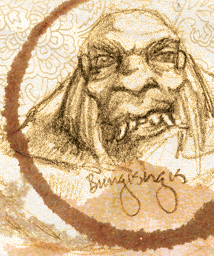 It seems simple enough; according to my starting point, the Bungisngis is a cannibal giant from Philippine folklore. His top lip is so big that he can pull it over his head (making him the male that can survive that joke about to understand the pain of child birth take your bottom lip and pull it over your head). They say that the hero Suac came along and stole the giant’s club, and used the club to subdue his enemies. Then I made the mistake of opting to try to learn more. Education is never the answer to these things, I swear! I easily found out that the Bungisngis is a creature of Philippine mythology. It was featured in an episode of “Da Adventures of Pedro Penduko”, which is the third and fourth season of the Filipino fantasy TV series “Komiks”. After that things get a bit more tricky. The story of Suac (remember Suac, the hero who stole the club?) well from what I see Suac killed a dark giant called Pugut. Pugut is a meat eater, but was more than content to eat a roasted hog, although he did threaten to eat the hunter (and later hero) Suac. Perhaps Pugut is a Bungisngis; you know, Pugut is his name and Bungisngis is his race? Another story with a similar set up has no mention of Pugut or of a Pugut, but instead has the villian as a Bungisngis, or the Bungisngis. There is no mention to his physical appearance, but again he wants to eat cooked meat. Instead of the hero Suac, this tale has a monkey defeat the Bungisngis. So what did we learn? Well, the Bungisngis is definitely a piece of Philippine folklore. Certainly a meat eater, who would gladly consider eating you if you anger him, but otherwise seems content to eat cooked game animals. Probably a giant. And maybe has the name Pugut. Of course Wikipedia paints an entirely different picture. According to their entry the Bungisngis is a giant from Filipino folklore, but they list it as having one eye, making it a cyclops, and they describe them as happy and playful…hardly the beast we just talked about. See what I mean? Sometimes learning more just makes things more confusing.